Stapled structures – is it really about something else? Late last month the Federal Government released the details of an integrity package dealing with so called stapled structures. Essentially these structures arise where two or more entities are commonly owned and bound together such that the interests in them cannot be bought or sold separately. At least one of the two entities is a trust. Such staples have been used in Australia by the property sector since the early 1980s. The problem with these structures arose with the introduction of the so called Managed Investment Trust (‘MIT’) regime in 2008. That regime was aimed at increasing the attractiveness of Australia's fund management industry (especially commercial and retail property funds) to mobile foreign investment. It achieved this outcome by lowering the withholding taxes on certain distributions to foreigner investors, particularly rental income to the withholding tax rate of 15%. As a result, foreign investors in stapled business structures were no longer affectively subject to tax at the corporate tax rate. Rather, the trust side of the staple being an MIT was generally taxed at the withholding rate applicable to rental income of 15%. Over time this rate differential has encouraged an increase in the use of stapled structures to convert active business income into passive income. For example, a single business could be split between an MIT and an operating company. The land assets necessary for use in the business would be held in the MIT but leased to the operating entity. The taxable income of the operating entity would be reduced by deductible rental payments to the MIT. The rental payments would obtain access to the 15% MIT withholding tax rate when distributed to foreign investors. In this way, the active income of the trading business was effectively being converted into concessionally taxed rental income. 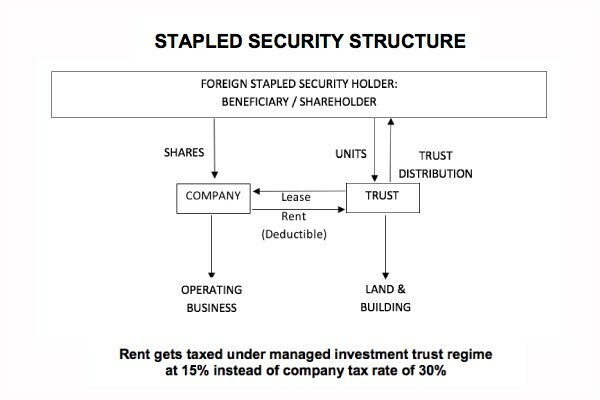 In effect, such stapled structures have resulted in the unattended emergence of a dual corporate tax system whereby taxes imposed on foreign institutional investors in land-rich industries applied a rate of 15% while other large businesses remained subject to the normal 30% corporate tax rate. This creates a tax bias in investment decisions potentially attracting capital towards land-rich businesses rather than businesses that are capital-intensive, knowledge-based and/or research-and-development-intensive. 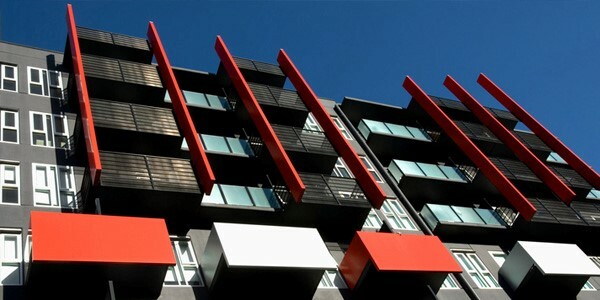 The Government proposes to deal with this by taking a number of steps to eliminate the most egregious cases of the misuse of stapled structures. The package involves five elements, the first two of which deal directly with stapled structures. Element A involves preventing active business income from accessing the 15% MIT rate and will impose the company tax rate as a withholding tax. Element B deals with stapled structures where there is a very heavy gearing towards debt in the use of multiple layers of companies. The current rules only require grouping of debt to test against the thin capitalisation rules where the entities are at least 50% held within the group. That 50% requirement will be reduced to 10%, thereby making the possibility of breaching the thin capitalisation rules in the context of a stapled structure much greater. Element E – excluding the 15% MIT rate on rent and capital gains derived by an MIT from agricultural land. The only certainty out of this is that the legislation that is likely to emerge will be highly complex. Of greatest interest will be not so much the way in which the Government proposes to deal with stapled structures but rather the way in which they deal with these hot politically-charged issues involving foreign pension fund withholding tax, sovereign immunity tax exemptions for sovereign wealth funds and agricultural land issues. * Robert Deutsch is The Tax Institute’s Senior Tax Counsel. This article was first published in the 6 April 2018 issue of the Institute’s member-only TaxVine newsletter.